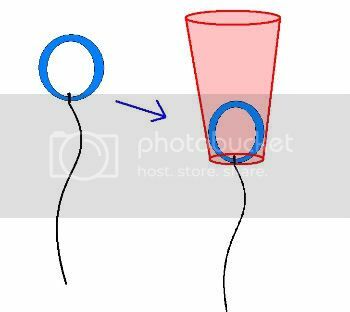 Tie a length of string to the ring to form the cord from the microphone. Drop the ring, string first, down into the large opening of the thread spool. The ring should wedge so that the mic cord hangs down from the small opening. Make a ball of tin foil slightly larger in diameter than the large opening on the spool. Place the ball again the large opening, and cover the ball with a large enough sheet of tin foil to cover the ball and wrap around the sides of the spool a bit. 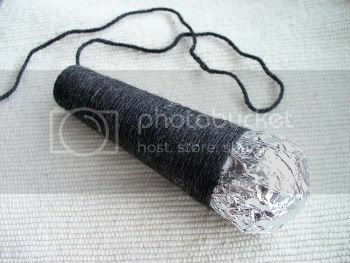 Starting just below the tinfoil ball, apply small amounts of glue to secure the string as you wrap it around the spool in rows, working your way down to the base. Let glue dry. 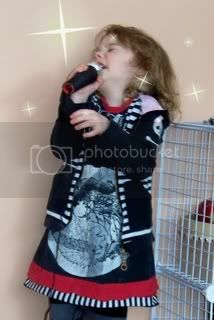 Give spool mic to child and play her favorite song. Here's the fun part for us biggies. I have just released another pattern zine that I am just dying to send out in the world. Now, you all know this pattern, given that it's actually a free tutorial on this site, but I have had enough requests for the specific bodice pieces I use and a number of people in the hard world have also asked for pattern and instructions. I like to be accomodating, so there y'all go. I would love to give away a copy of the tiered patchwork twirler pattern zine. Here is how to play: enter by leaving a comment on this post about what your wee one's (or a wee one close to you) favorite song is. I will draw a random comment on friday night (april 3) my time (west mountain time), after the kids go to bed (I know how you all love how vague this is, but thus is my life). by emailing me: vegbee[at]littleprintdesigns.com with the subject line: call the girl police. Good luck! Talk again on friday! I popped over to random.org and drew up Caroline for the comment draw and Jody for the Call the Girl Police draw. Which is from 'Little Plastic Castles' by the indomitable Ani Difranco. Congratulations to both winners and thank you all for playing. I do love these giveaways, and I especially loved reading the amazing diversity of music your wee ones are listening to. Thanks all for sharing! ka-yute dress!!! My 4 yr old asked for a dress that twirls the other day.... So today my 2 yr old is singing "we are the dinasaurs" by Laurie Berkner as she stomps around the house.... as for lyrics....never had much use for them. I lvoe to dance so I always tune in tot he beat, and rarely know what the words are in songs! Love her consumed expression! My son's favorite song of the moment of the third song on the Twilight soundtrack--I can't remember the name. It has a lot guitar though and he's all about the guitar!! I would love to win! My four-year-old daughters loves a lot of songs, but I'll tell you the funniest one she loves: "I am the Walrus" by the Beatles. She always asks me to play "The Eggman" song while we're driving. You know, "I am the eggman, They are the eggmen, I am the Walrus.Goo Goo g'joob." It makes me laugh every time she requests it. Thanks for all the great tutorials! I really look forward to trying the work shirt circle skirt. Right now my daughters' favorite songs are "Singing in the Shower" by Sandra Boyton and Big Rock Candy Mountain on the Oh Brother Where Art Thou sound track. Thanks for the give away! I've got a couple of darling granddaughters who love to sing AND dress up pretty. I just discovered your blog last week, and can hardly wait to get to some sewing! Their favorite songs are most everything by tobymac, but probably "Made to Love You" is the top one of all. Thanks for sharing your terrific creations! Well, isn't that a coincidence...I was just coming on to get the tute for the twirly dress! My 10 y/o daughter wants to make one for my toddler. She'll cut the squares and piece them together, I'll do the gathering. I hear that's the part that can make a gal go mental. My toddler's favourite song is part of a commercial, the "I Love The World" one for the Discovery Channel. She definitely gets her groove on for that :) . My just-turned-two year old loves "Hot & Cold" (clean version on Kidz Bop) by Katy Perry. She rocks out! It's hysterical! Well I dont have a little girl anymore (she's now 9) but my nieces would love for me to make them a a beautiful dress. My son's favorite song however (besides Happy Birthday)is Handlebars by THe Flobots. It is so funny listening to him sing along. I love this site and just came back to check your tutes for spring and summer wear...the best part is that I am actually needing to make a Kimono, because my daughter requested a Chinese New Year birthday party, and I came across the pics of your great kimono. So my to be 4 yr old LOVES "spinny" dresses and would go koo-koo bananas for one of these. And I have some awesome scrap gingham square scraps that would be perfect. Her favorite song...well there are many but the one that has stuck the longest is Folsom Prison Blues by Johnny Cash. She requests we sing it every time we pass the overhead train in our groceries dairy dept. wow- great blog! My son probably wouldnt appreiciate this skirt, but my neices definately would!! at the moneht they are 'still' adicted to high school musical- so any number of songs from there would have them singing and dancing away for hours!! PS- i think the lyrics are from 'little plastic castle' by Ani Difranco?? My daughters favorite song is 'Umbrella' By Rhianna. Although shes beginning to love the song on Noggin.. Flowers are the smellist, bugs are the buggiest..Everywhere you go..lol.. Thanks for offering this pattern!!! My daughter likes to make up words to her favorite tunes of Twinkle, Twinkle, Little Star and The Wheels on the Bus. Thanks for the giveaway and all of you tutes. My 3 year old daughter loves to sing her medley of ABC's and Twinkle, Twinkle Little Star. She loves to listen to Bonnie Rait's, Baby,Mine and she always asks me to sing, Moonriver. My daughter doesn't sing yet, but I'm sure she'd start with one of those twilers. 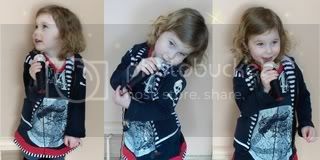 That expression on your little one's face as she croons is the funniest! My daughter is 4 and she sings so much it's hard to pick a favorite. Among some of the funny ones are "Lime Jello Marshmallow Cottage Cheese Surprise" and "Henry the Eighth I Am". my daughter is two and behind on her speech development. so yesterday, as she was finishing playing with something, she started putting them all back in the drawer and i heard her sing to herself, "clean up! clean up" (i think it's originally a song by barney!) and i was so proud of her! Both my girls are big fans of the Curious George soundtrack. Especially, "Upside Down." Thanks for the opportunity to enter! right now my 3 year olds favorite song is "down my the bay" and we try to think of different silly things to sing about. Like she just came up with "Have you ever seen a goat riding in a boat?" My 3yr old loves Johnny Cash. Not kidding. Went to see the walk the line movie when i was pregnant and he would move like crazy when he was singing. Still soothing to this day, can turn it on mid tantrum and he will stop. DD went through a sleepless stage and would go to sleep when we watched across the universe. She loves them Beatles! Also, made your patchwork skirt and paired it with a peasant blouse, love it, love your stuff, thanks!! My 18 month old girl loves 'Twinkle Twinkle Little Star' and sings it in her own baby-babble words. Too cute! Love your stuff. All the best with the craft show coming up. Since I am over on the other side of the big pond called the Atlantic, I am sadly not going to be able to come show my support in person. Will send spiritual support instead! Since my daughter was about 3 months old, she LOVES the song "Novocain" by Little Big Town. She used to fall asleep every time I played it, even if she was mid-cry. Now, she dances. My little girl's favorite song right now is anything by The Lemon Twists. They are this punk rock band for toddlers! A little close to me loves to sing "Great Ball of Fire" often she includes her own words just to get a laugh...."goodness gracious great shoes of fire!" It is hilarious! oh yeah...."Someone call the girl police" is an Ani Difranco quote. Little Plastic Castle. I have that bumper sticker on my car!!! Ah, I just love your site!!! Simply lovely. My 2 year old's fave tune is "Doodlebugs" by Laurie Berkner. Thanks for sharing your wonderful ideas!!! My grands all love The Ladybugs Picnic from Sesame Street. I love your blog, I found you after admiring your work on Craftster. Thanks so much for sharing! Love this! Just successfully finished a patchwork quilt, so this may be a nice next step. My kiddo's current favorite song is "Alice the Camel". Now Alice is a horse! My daughter's favorite song is "Sparkle Spirit Style" which is a CD that came with her American Girl Doll: "There's lots of good inside of me I'm ready to give. I'm glad to be an American Girl"
My little girl is still too young to have a favorite, but she LOVES anything with a fun beat, she gets a big grin and starts "dancing" (aka bobbing up and down while trying to maintain her balance and move closer to the music source). Cutest thing ever! So cute! My little one's favorite song is currently "Tootie Ta" although she likes to shake her rear and say "Pootie Ta!" My little girl loves any of the highschool muscial songs. She loves dresses too, and yours is very cute! My daughter would love for me to make her that dress!! My eight-month-old listens intently when I sing Eidelweiss to her, substituting the word Edelweiss with her nickname, Smackerell(a). That last photo of your daughter is PERFECT. I like the stars, too. My grandaughters would love this dress. the one nearest me loves to sing "Girls Just wanna Have fun" by madonna. I taught her the song and she drives her mom crazy singing it in the car. She bounces in her seat and she laughs because it makes my truck bounce down the street. Grandma Daycare is about driving mommy crazy. my 4 year old girls' fav song is the original spiderman cartoon opening song ... "spiderman ... spiderman ... radioactive spiderman". its got awesome 80s guitar rips. it is an awesome song LOL. worth finding on youtube! she makes everyone in the house listen when she watches that DVD! hope it is not too late, my 17-mos old baby's favorite is old macdonald. That is super cute. My 2.5 yr old's favorite song is once upon a dream from sleeping beauty. And my 8 month son loves the hello song from our music together class. I *LOVED* my play microphone when I was little! This is fantastic, I'll be linking. LOVE it that she loves Bob Marley!!! Ooo, I like the mic you made :) I actually made one the other day, though I used different materials.